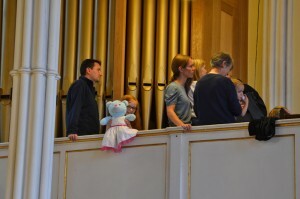 Teddy bears everywhere! Even on the organ console. During the afternoon of Saturday 10th September some very important bears and their friends arrived at St Mary and St Giles Church to be welcomed by a small hand-turned street organ serenading them with the specially arranged Teddy Bears' Picnic and other tunes. They made their way upstairs to the gallery and clustered around the console for some nursery rhyme music about the organ and a chance to try the organ for themselves. Jonathan Harris had dashed in from playing organ at a wedding at a church in Northampton to play for the very important bears. 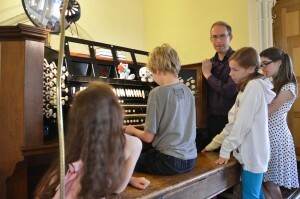 He introduced them to the organ using a couple of different pieces written for children about the organ. 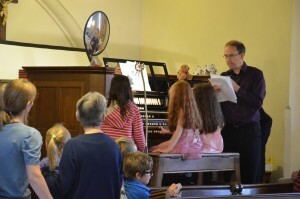 The second piece used variations on Twinkle Twinkle little star - Randolph Currie's "A young person's guide to the pipe organ" which includes some narration. 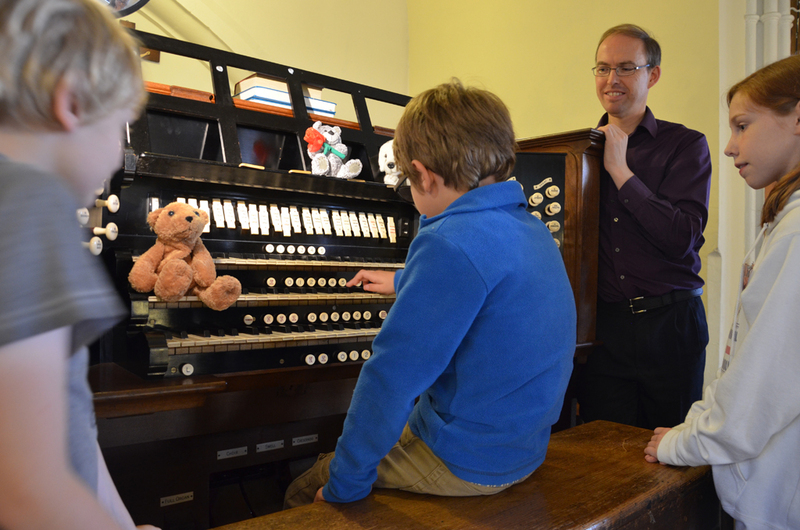 One of Jonathan's young organ scholars held the microphone for him and turned the pages and some bears danced along to the music. 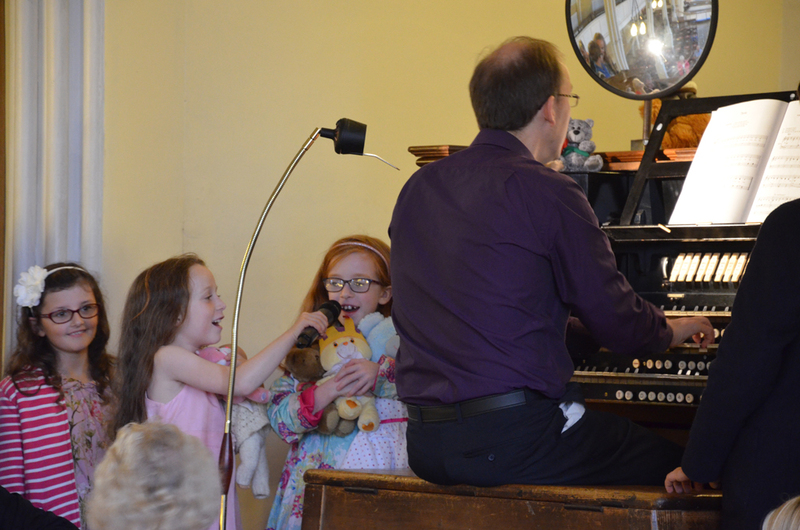 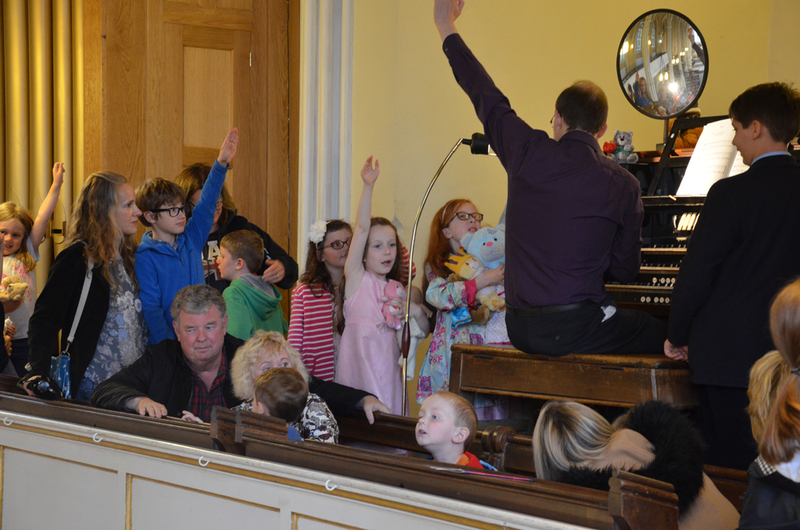 Jonathan finished with The Teddy Bears' picnic then some of the bears and children got their chance to try the organ while some of the others went in search of their picnic (in the Parish Hall). 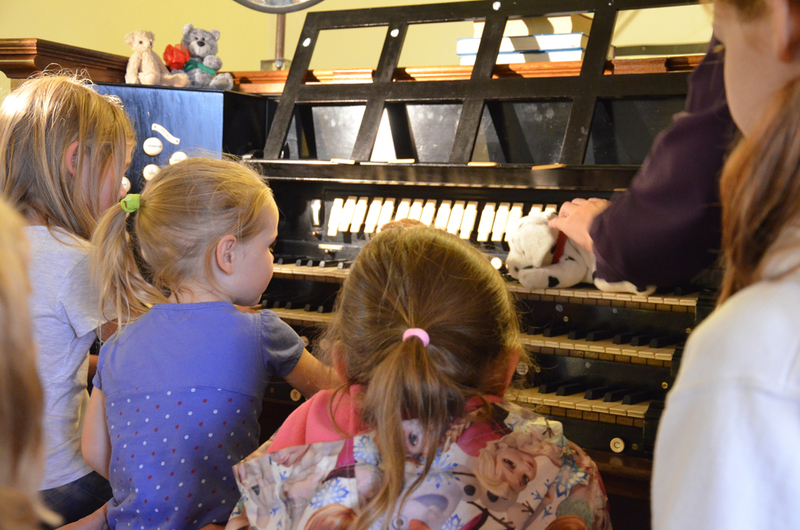 Most of the teddy bears were not big enough to reach the pedals and keyboards at the same time however they had fun pressing the keys or playing simple pieces if they were learning the piano. 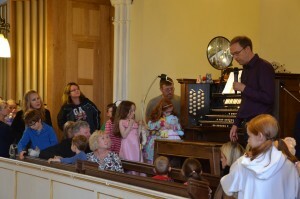 For most of them this was their first encounter with a large pipe organ and they seemed very impressed. 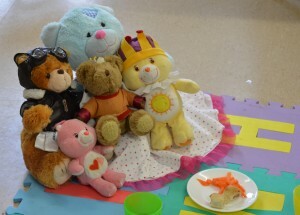 In the Parish Hall the picnic was in full swing with teddy paw sized snacks, squash (and tea for the older bear handlers). 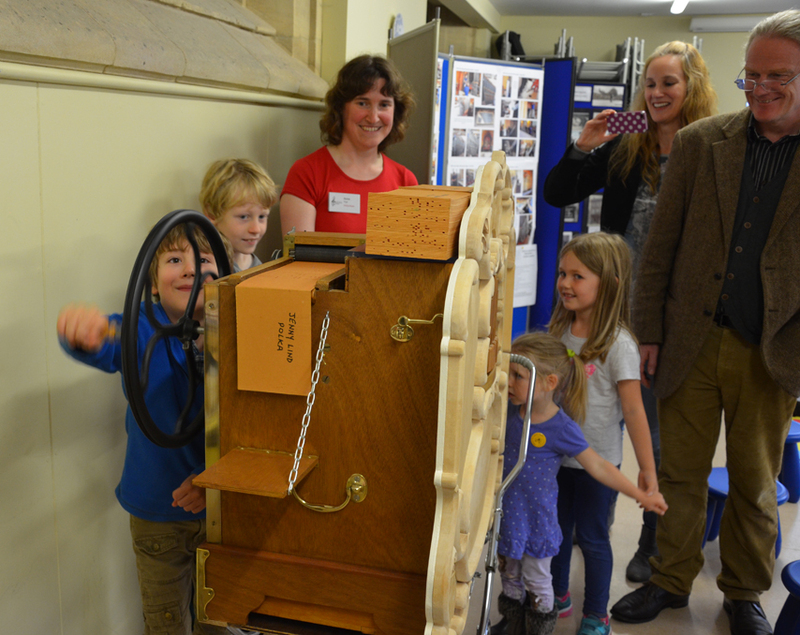 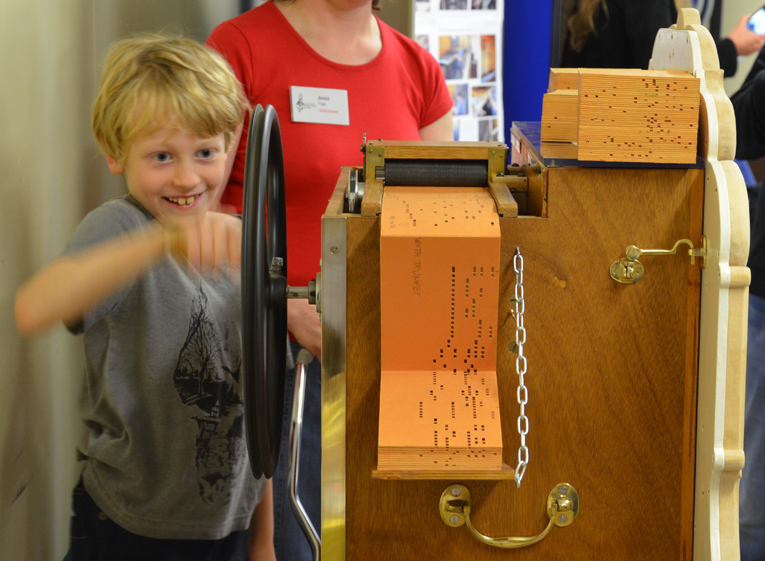 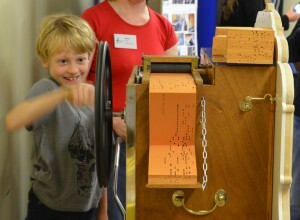 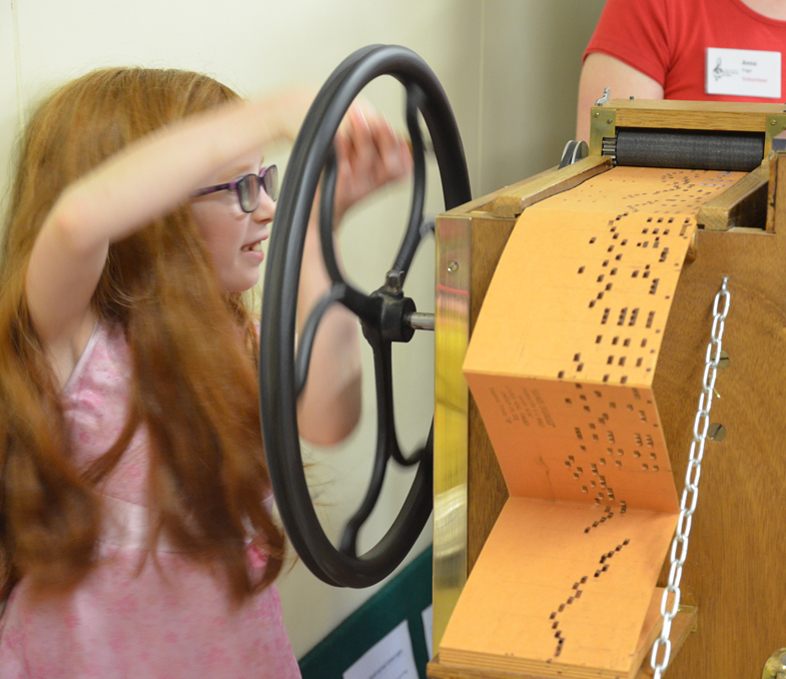 The small street organ had been wheeled into the Parish Hall and some of the children were able to hand-turn it to play music via the punched cardboard books, much to their delight. 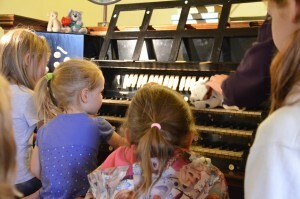 "I liked the fact that the children were allowed to play the organ"
"Children enjoyed having a go on the organ"
Thank you to all the volunteers who helped make all the teddy bears and friends feel very welcome at their musical picnic and to Jonathan Harris for playing the organ for bears and children of all ages. It said: "25 August 2016. 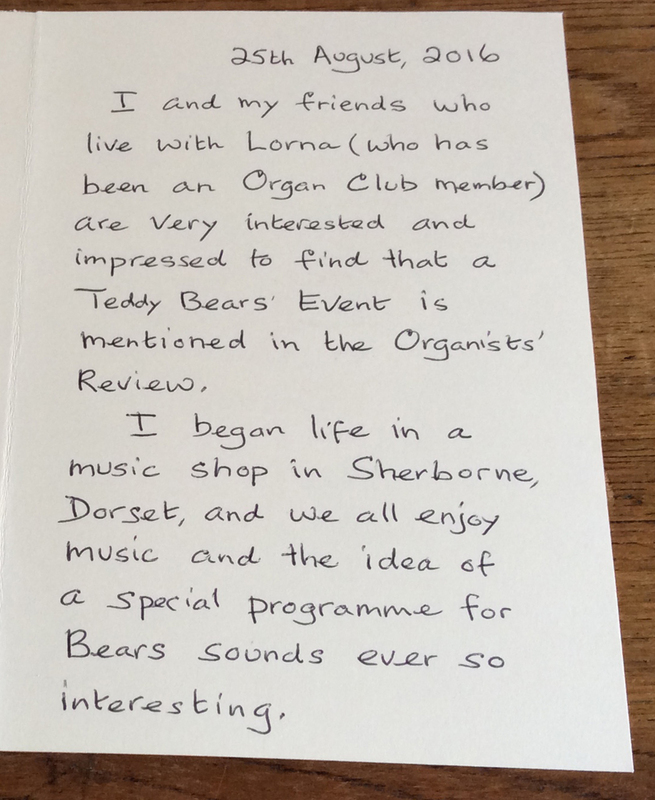 I and my friends who live with Lorna (who has been an Organ Club member) are very interested and impressed to find that a Teddy Bears' Event is mentioned in the Organists' Review. 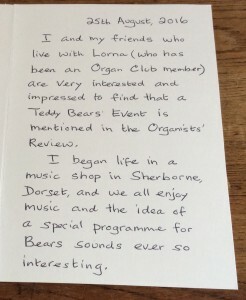 I began life in a music shop in Sherborne, Dorset, and we all enjoy music and the idea of a special programme for Bears sounds ever so interesting. 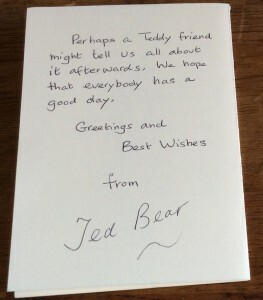 Perhaps a Teddy friend might tell us all about it afterwards. We hope that everybody has a good day. 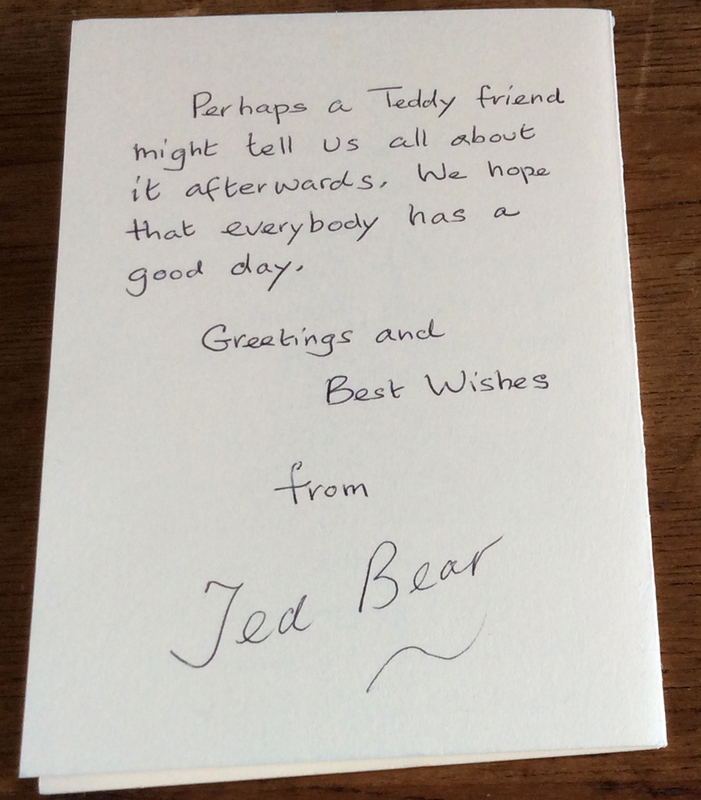 Greetings and Best Wishes from Ted Bear"
Ted Bear, judging from the comments made by those who attended, the Teddy Bears' picnic was a big success. 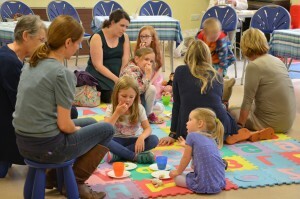 Please note, these photos are All Rights Reserved and may not be used without permission. A short postscript - in the early days of organ fundraising the idea of a Teddy Bears' picnic was suggested by Sylvia Lovesey. Sadly, Sylvia died in 2012 and we do the Golden Spot Tombola (her invention) every year in her memory. 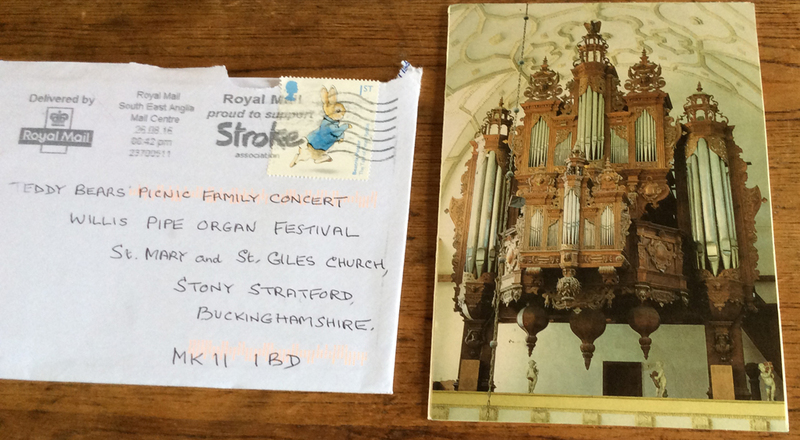 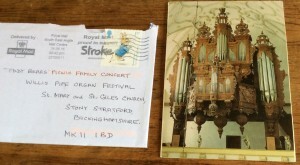 I am pleased that at last we have been able to realise another of her great ideas for the organ.